What if a Siberian Joan of Arc had rescued the White Armies at a critical point of the Russian Civil War? MAID OF BAIKAL offers an alternative outcome to that war through the intervention of Zhanna Dorokhina, a young woman from the shores of Siberia’s Lake Baikal. Lately, however, the voices have turned ominous, foretelling Russia’s doom if the White Armies fail to drive the Bolsheviks from Moscow. Obeying her voices, Zhanna travels to Omsk to alert the Siberian dictator, Admiral Kolchak, and to seek command of an army to besiege the capital. When Zhanna informs her father, he thinks her mad. But a young American intelligence officer and his Russian counterpart help her win an audience with the Admiral, and the two young men become her wartime companions. Like the historical Joan of Arc in medieval France, Zhanna displays a remarkable charisma and military prowess that, in due time, win her command of an army. Over the coming months, she leads her men across vast expanses of untamed forest and steppe, where suffering, violence and treachery await at every turn. Zhanna’s obsessive pursuit of victory provokes powerful rivals, however. Defying a ceasefire, she wins her greatest battle, only to ride into a Bolshevik ambush. Held captive, she can expect no rescue. Thus she must endure a vengeful show trial alone and await its verdict without knowing whether her prophecies will ever be fulfilled. MAID OF BAIKAL is a richly imagined speculation on the Russian Civil War that vividly portrays its violence, bitterness, and hardship, while telling the inspirational story of a determined young woman who perseveres in the face of overwhelming obstacles. 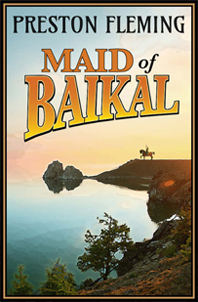 Preston Fleming has recorded an introduction of MAID OF BAIKAL for Russian readers. The video was produced for the blog of Russian human rights activist Maxim Efimov.